Click the button above to be re-directed to our DonorBox site, where you can securely donate directly to CAPCO. Click the button above to be re-directed to our Givelify site, where you can also securely donate to CAPCO. For over 25 years, CAPCO has demonstrated itself a worthwhile organization, but our growth relies on continual contributions from independent donors. Our staff sincerely values the trust of its clients, and no less genuinely do we value the trust of our donors: the executive director extends budget transparency to prospective donors who are interested in our overall expenditure and in statistical information regarding distributed supplies. Using any major credit card, you may donate online through FirstGiving’s secure server. You may also send checks directly to the CAPCO Resource Center. Or you may personally present your gift to our Executive Director Jerry C. Dillard at the CAPCO Resource Center! 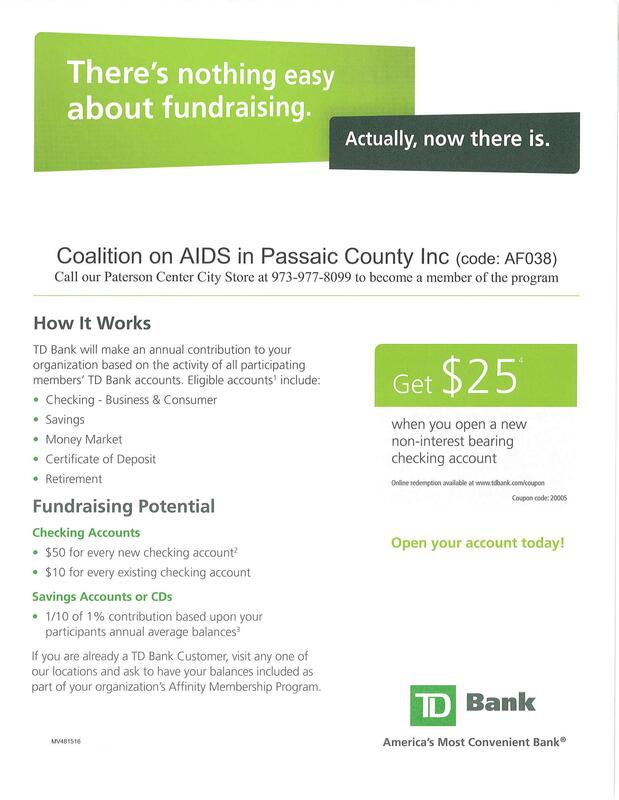 Kindly make checks payable to The Coalition on AIDS in Passaic County. We thank you very much for your consideration and for your generosity! If you are interested in donating your time to our cause, you can even apply as a volunteer at the CAPCO Resource Center! In the process of donating your time toward our clerical operations, you’ll have the opportunity to shape a first-hand understanding of the logistics that drive a charitable agency. If you’re eager to lend a hand—especially if you’re a college student seeking an experience opportunity—get in touch with our office!